This is an excellent and taught trio of Martin Kuchen on tenor and soprano saxophones, Jon Rune Strom on bass and Tollef Ostvang on drums. Recorded in Norway in April of 2014, the men waste no time getting down to it on the opening track “Satan in Plain Clothes (Breakdown)” which is also the name of a band these three musicians are in that recorded an album for Clean Feed Records earlier this year. The music here is lean and tight, and Kunchen’s tenor tone is raw and coruscating and the bass deep, leading the group into “I’ve Been Lied To” and supporting long tones of haunted saxophone which build slowly into a strong and heavy collective improvisation, lashing out and reaching back with dynamic fervor. “Tune For Martin” allows the saxophonist center stage to show his own personal voice, deeply raw and potent switching to soprano and probing the music before launching into a powerful and well thought out improvisation duly supported by fine bass and drums. “Melted Snow” heavy weighted feeling deep dark saxophone buoyed by nimble percussion, Albert Ayler-ish peals of saxophone, reaching forth unflinchingly. Short bass solo and feathery percussion dancing around. “Three Courses” features heavy wailing saxophone reminiscent of Peter Brotzmann, before great three way improv develops with storming drums, howling saxophone, elastic bass. They reprise the “Satan in Palin Clothes” theme to wrap up the album, subtitled (Beat Up) and it is a bruiser, led by brawny saxophone and tough drumming, at a medium pace, they mine a deep groove and take it to the bank. I know that this was a collective effort and all of the musicians play very well, but Martin Kuchen was really a revelation to me. His throaty immensely powerful saxophone tone and boundless energy was a joy to hear. NoBusiness pressed this as an LP with only 300 copies, so if it sounds interesting, you better contact them shortly. 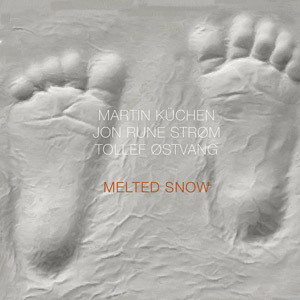 Martin Küchen, Jon Rune Strøm, Tollef Østvang - Melted Snow, No Business Records.